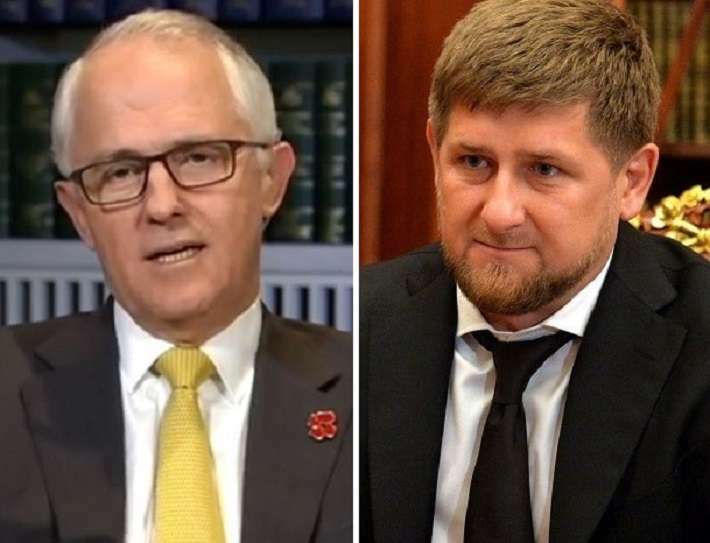 Prime Minister Malcolm Turnbull has been urged by LGBTI advocates to take stronger action to stop the horrific violence against LGBTI people in Chechnya. Russian media and human rights groups say at least 100 men have been detained and violently tortured because of their homosexuality in secret prisons in Chechnya, with several men reportedly dead. “I also urge your Government to work with other like-minded governments to formally censure Russia at the United Nations and to launch a UN investigation into the extent of the abuses on Chechnya,” Mr Croome wrote. Mr Croome said German chancellor Angela Merkel had “lead the way” earlier this week when she confronted Russian President Vladimir Putin about the issue. Putin responded by saying he will ask his country’s prosecutor-general and interior minister to help Russia’s human rights ombudswoman Tatyana Moskalkova investigate the reports, but still described them as “rumours,” Sky News reported. “I hope the colleagues respond and support you,” Putin told Moskalkova. But a Putin spokesperson said in April an earlier investigation found “no evidence” of the violence, despite dozens of survivors speaking out. Chechen leader Ramzan Kadyrov (pictured, right) has repeatedly denied the men are being persecuted, going as far as saying Chechnya has no gay people at all. Australian Foreign Minister Julie Bishop said last month the federal government was concerned by the reports of the persecution. “We have raised our concerns directly with the Russian government,” Ms Bishop said. As you will know, officials in the Russian republic of Chechnya are rounding up, incarcerating and reportedly murdering men because they are gay. I congratulate your foreign minister, Julie Bishop, for expressing concern about this to the Russian Government. But Australia has an obligation to do more. It is vital that heads of government make direct representations. The German Chancellor, Angela Merkel, has lead the way by expressing her concern directly to Vladimir Putin. I urge you to introduce a motion to Parliament condemning the cruelty of the Chechen Government and the indifference of the Kremlin. I also urge your Government to work with other like-minded governments to formally censure Russia at the United Nations and to launch a UN investigation into the extent of the abuses on Chechnya. Your support for the victims of anti-LGBTI persecution in Chechnya, as well as the support of the Australian Parliament, will send a strong message. Two weeks ago Tasmanian Liberal Premier, Will Hodgman, apologised for Tasmania’s former laws against LGBTI people. He also moved a motion, last year, condemning the massacre of LGBTI people in Orlando. Having witnessed these events first hand, I can vouch for the positive moral and cultural impact of a head of government repudiating persecution and discrimination against LGBTI people. One of the most important roles of a Prime Minister is to gather up the aspirations of millions of everyday Australians for fairness, equality and respect for human dignity, and deploy those aspirations to good effect. By your timely action, let those who suffer in Chechnya be the beneficiaries of our nation’s aspiration for a world without homophobic persecution.